In the modern world, there are all sorts of devices intended to make housework easier. These labour-saving devices range from vacuum cleaners and washing machines to food processors and electric mops. They allow you to use less physical energy and promise to give you a deeper clean. However, this is probably not how your mama did her cleaning. She probably didn’t have access to fancy technology and had to do the things the old-fashioned way. If your mum was more traditional in her approach, she might be pushing you to do things her way. And if you have a more modern outlook, you probably ignore her. Still, some of her points hold merit. Here at HouseProud, we use all kinds of house cleaning services, both old and new, and we’ve found that some are surprisingly effective. Similarly, using electric mops and floor scrubbers can save hours, especially if you’re cleaning a large area. The trouble is you may not get rid of stains and dirt that has set into your surfaces. It may also require additional rinsing and a dry-mop to remove excess water. Manual mopping and scrubbing may need more elbow grease and keep you on your knees, but you’re less likely to miss a spot, and you can treat specific stains using the right stain-removal agent. You can squeeze out the mop and get rid of moisture that may leave water marks. 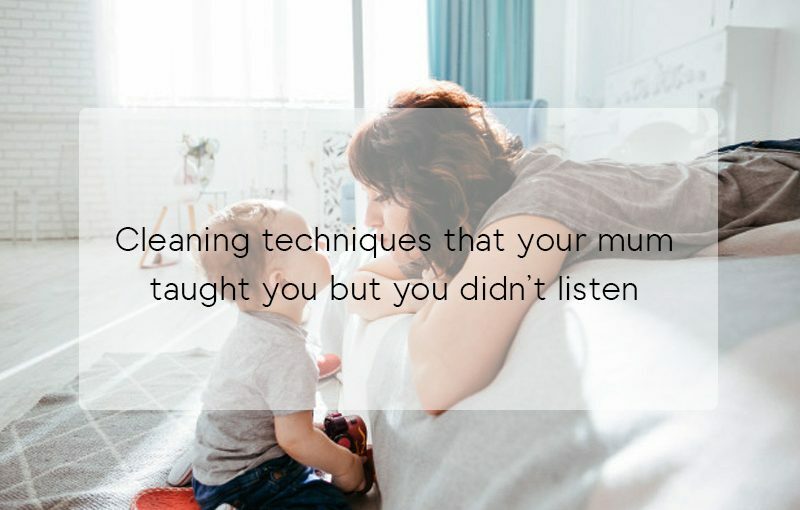 As you run through supermarket aisles buying the latest commercial cleaning enzyme and no-scrub gadget, you may overlook your mum’s home remedies. For instance, a basic paste of white vinegar and baking soda can get rid of all types of stains. Burnt pots and pans can be soaked in boiling water and vinegar followed by a few teaspoons of baking soda. Wait a few minutes then some light scrubbing will get rid of all the scorch marks. Blocked drains can be cleared by pouring hot water down the hole, sprinkling some baking soda down the drain, then pouring white vinegar after it. The mixture is also good for getting scum off bathroom tiles, shining your sinks, lifting carpet stains, and freshening up your fridge. To learn more about cleaning techniques and get some help keeping your house clean, call HouseProud today on 1300 880 198.